Sylvester Stallone, Michael Caine, Pelé, Bobby Moore, Osvaldo Ardiles and Paul Van Himst in director John Huston's Victory (1981), and members of the brave North Korean team in Daniel Gordon's documentary The Game of Their Lives (2002). Even though Mueller, Messi and Ronaldo packed their bags early this year, the World Cup is still the most watched sports event in the whole world. Who is the most brilliant football player of all time? He is the great Pelé of Brazil. Pelé played a movie version of himself in Victory (1981) directed by John Huston. It is about Allied prisoners of war who are interned in a German prison camp during the Second World War and who play an exhibition game of football against a German team. Besides Pelé it also starred professional footballers Bobby Moore, Osvaldo Ardiles, Paul Van Himst and many others. Guess who won. On the other hand Keira Knightley starred Bend It Like Beckham (2002) when she was just seventeen. It’s a very good football film, just like like the Iranian movie Offside (2006) directed by Jafar Panahi. But as a Korean, the most impressive soccer movie for me is the British documentary The Game of Their Lives (2002) directed by Daniel Gordon. 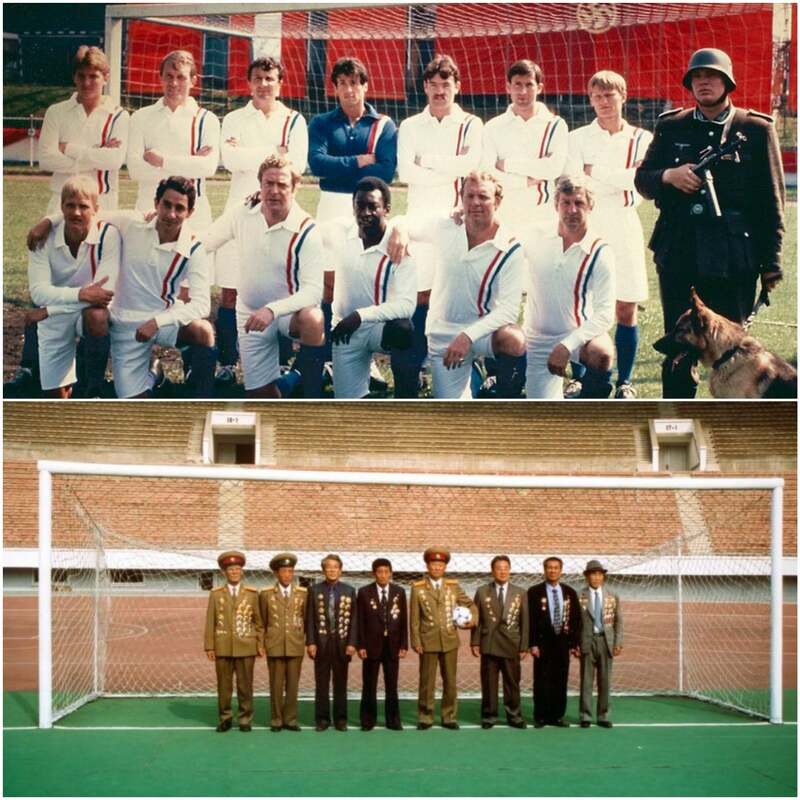 It is about the seven surviving members of the North Korea national football team who participated in the 1966 FIFA World Cup. Its victory over Italy (1 to 0) propelled the North Korean team into the quarterfinal: it was the first time an Asian team had advanced so far in a World Cup. Parminder Nagra and Keira Knightley in Gurinder Chadra's Bend It Like Beckham (2002). 축구 역사상 가장 훌륭한 선수는 누구일까. 전문가들은 주저 없이 브라질에 세 차례나 챔피언십을 안겨준 펠레(77)를 꼽는다. 이런 펠레가 스크린에 나와 필드에서 공을 차면서 배우노릇을 한 영화가 ‘빅토리’(Victory‧1981)다. 이 영화는 2차대전 때 독일군에 포로가 된 연합군의 전직 축구선수들과 독일 대표팀과의 한판 승부를 다룬 ‘축구전쟁’ 영화다. 스포츠란 궁극적으로 극적 요소들인 인간관계와 상대방과의 대결 그리고 승패가 있는 것이어서 영화의 좋은 소재가 되고 있다. ‘빅토리’도 이런 요소를 고스란히 갖추고 있다. 이 승리에 일등공신 노릇을 하는 선수가 바나나킥을 구사하는 펠레(사진). 축구와는 거리가 먼 해치는 짧은 연습을 거쳐 골키퍼를 맡아 독일팀의 페널티킥을 방어하면서 맹활약하는데 그런 신기는 스탤론이어서 가능한 일이다. 펠레에 관한 또 다른 영화로는 ‘펠레:전설의 탄생’(Pele:Birth of a Legend‧2016)이 있다. 펠레의 소년시절과 축구선수였던 아버지와의 펠레와의 관계를 다룬 것인데 상투적이요 단순하고 깊이가 모자라는 졸작이다. 경기하는 장면을 보여주지 않는 축구영화가 ‘오프사이드’(Offside‧2006)다. 2030년까지 작품 활동과 출국이 금지된 이란의 반체제 감독 자파르 파나히가 만든 베를린영화제 은곰수상작. 2006년 월드컵 출전권을 놓고 이란과 바레인이 격돌하는 경기를 보고파 안달이 난 소녀의 드라마인데 문제는 여자의 축구경기장 입장을 금지한 이란의 법. 제목에 베캄이라는 자기 이름이나오는데도 막상 본인은 뛰지 않는 축구영화가 ‘베캄처럼 차라’(Bend It Like Beckham‧2002)다. 런던지역에 사는 보수적인 부모 때문에 부모 몰래 지역팀에서 뛰는 인도계소녀와 그를 격려하고 돕는 영국소녀(키라 나이틀리)의 우정과 강슛을 잘 섞은 영화다. 베캄은 영화 끝에 부인 빅토리아와 함께 잠깐 나온다. 한국 사람이라면 감동하지 않을 수 없는 영화가 영국 감독 댄 고든이 만든 기록영화 ‘그들 생애의 경기’(The Game of Their Lives‧2002)다. 1966년 영국에서 열린 월드컵경기에서 북한의 천리마 축구단이 강호 이탈리아를 1대0으로 제압한 사실을 담았다. 당시 북한이 이탈리아를 이길 확률은 1,000대 1이어서 이 경기는 월드컵 사상 최대의 충격적 사건으로 여겨지고 있다. 2022년 11월부터 12월에 걸쳐 카타르에서 열리는 다음 월드컵경기에서는 한국과 북한이 한 팀이 되어 뛰는 것을 보고 싶다.